Kohler has been manufacturing generators for almost 100 years with one simple goal in mind, build the best generators in the world. Kohler generators are trusted everywhere from hospitals, nuclear power plants, hotels, and restaurants, to the average homeowner. The engineering team at Kohler has worked to equip every generator with a commercial-grade engine built to withstand extreme capacities over numerous years. Every generator during the design process is quality-tested under extreme conditions, through hundreds of performance tests, and then thoroughly examined. The result is total reliability, so you can rest assured in the case of a power outage. With meticulous work our engineering team has developing generators down to a science. 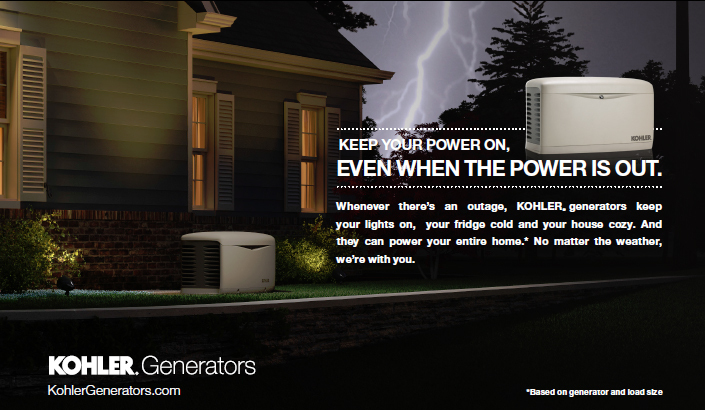 It only takes 10 seconds for a Kohler generator to automatically restore power. Allowing your major appliances to continue running seamlessly. Believing in the quality our engineers produce, Kohler backs its products with a 5-year premium warranty. We are proud to say we offer Kohler commercial generators for businesses where having power is critical. Delcor’s partnership with Kohler allows us to serve industries of a crucial nature that take huge losses when the power is out such as, hospitals, medical clinics, dialysis center, nursing homes, restaurants, and more!